INDIA - An Indian statesman is championing native cattle as part of the National Dairy Policy due to hardiness. India's minister of state for agriculture and agri-processing, Dr Sanjeev Balyan, has said that tolerance to tropical weather conditions means indigenous cows can increase rural income. The minister said this while inaugurating one-day ICAR-NAVS expert consultations meet on strategies for enhancing milk productivity of indigenous cattle. 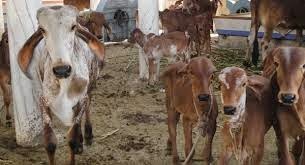 For this purpose, the government has launched the Rashtriya Gokul Mission for improvement of indigenous cattle, Dr Balyan stressed. Dr Balyan hoped that the project will yield rich dividends and the mission aims to conserve and develop indigenous breeds in a focused and scientific manner, for which breeding facilities will be set up for breeds with high genetic potential. "A well thought out cattle breeding policy which was in place 50 years ago which included selective breeding of indigenous milch cattle breeds in their breeding tracts and to use them for upgrading local cattle. "However, the policy was not followed in letter and spirit and indiscriminate crossbreeding was done which has resulted in erosion and dilution of our rich germplasm of high yielding indigenous milch breeds,’ Dr Balyan adds. Dr Balyan was also conferred with the Honorary Fellowship of National Academy of Veterinary Sciences by President of the Academy for contributing significantly in the area of agriculture sector in general and livestock in particular. A.S. Thakur, Secretary, Department of Animal Husbandry, Dairying & Fisheries, India also briefed on various initiatives taken by the government for improvement of milk productivity and conservation of indigenous cattle germplasm. The meet was organised jointly by Indian Council of Agricultural Research (ICAR) through National Bureau of Animal Genetic Resources (NBAGR), Karnal; Central Institute for Research on Cattle (CIRC), Meerut and National Academy of Veterinary Sciences (NAVS).